She gives Success, Happiness and Name. 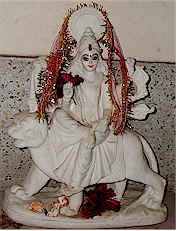 Devi Chandi ...the another name of Devi Durga is the symbol Shakti who protects the human being from the happening of all evils and blesses with Success, peace, abundance and Prosperity. 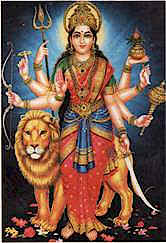 The purpose of the Chandi Homam is to remove any obstacles or blockages in growth – both internally and externally – for a person or a group of people. Chandi homa is very useful for the getting success, wealth, prosperity, fame, removal of fear, health, longevity, Fulfilling of Desires, food, progeny, strength, removing ailments, removing danger and defeat in the hand of adversaries etc. This Homa is really very useful for the elimination of all sufferings... protection from all miseries, fulfillment of your wishes and Desires, Rescue you from any Harm & dangers, getting of spiritual benefits and GIVING YOU THE VICTORY. Chandi Homa or Durga Homa is one of the most auspicious and an elaborated Homa and Puja ritual where more than 700 of Devi Chandi Slokas (Mantras) are chanted with full devotion and great care at a stretch, so that you can get the Holy and Divine Blessings of Devi Durga or Devi Chandi and so that all your desires get fulfilled. 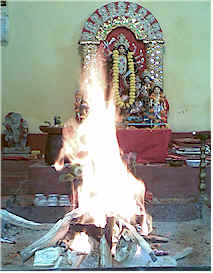 After this homa, Holy Puja is to be held periodically for you for next 1 month to Devi Durga.